30 GALLON SPILL PICK-UP. 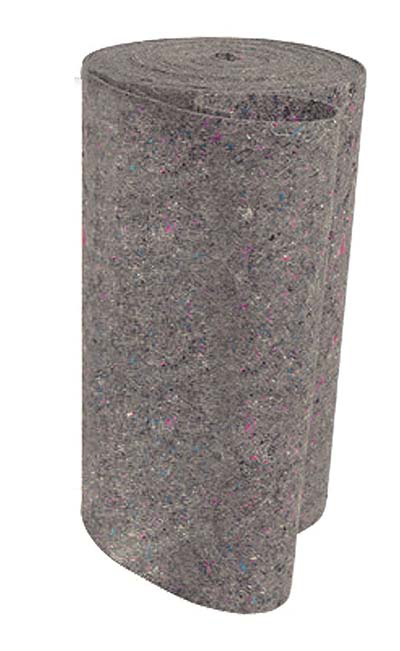 Stock these weatherproof spill response drums, in the sizes you need, around the plant, warehouse, chemical storage, and mixing and loading areas.After cleanup, drums can serve as sealed, safe storage and disposal containers for absorbed spill materials. 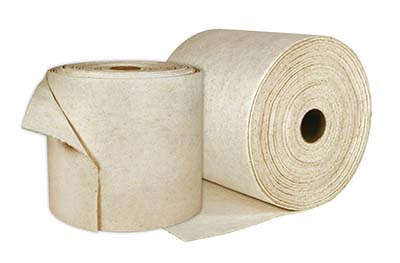 Or use the included HazMat disposal bags and restock the drums with our CHEMSORB® Bulk Variety Pack (SP17390) and fresh PPE - a reorder list is included in each drum. This 55-gallon drum contains enough CHEMSORB sorbent to absorb 30 GALLONS OF LIQUID SPILL. Contents include: 15 CHEMSORB Diking Tubes, 10 CHEMSORB Pillows, 4 HazMat Disposal Bags, 2 Tychem SL Saranex Coveralls, 2 pair Splash Goggles, 2 pair Rubber HazMat Boots, 2 pair 15 mil Nitrile Gloves, 1 Roll Caution Tape, 4 HazMat Labels, 4 Non-Hazardous Waste Labels, 1 Parts Reorder Form. 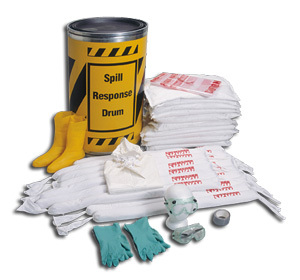 Keep your spill response items organized and ready for use. Fits easily in any vehicle sprayer, nurse tank or chemical transport truck, and can be wall hung around your plant and warehouse for visibility and easy access. The Minuteman Kit comes in a portable, highly visible orange nylon duffel pack. This kit is packed with the key products you need to clean up a hazardous spill. Pickup rating is 5-6 gallons of liquid per kit. Includes: 2 CHEMSORB" Sorbent Pillows (26"x16"x2"), 3 CHEMSORB" 48" Diking Tubes, a pair of 15 mil nitrile gloves, a pair of safety goggles, Tychem SL Saranex boot covers and 2 HazMat disposal bags with labels. Compliance: OSHA 29 CFR 1910.119-120. 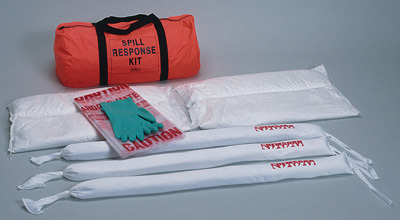 This slim, Komatsu Mobile Spill Response Kit fits easily in your vehicle & may be hung on the warehouse or shop wall to give you immediate response to chemical spills. Ideal for pesticide-hauling vehicles, chemical handlers and haulers, around mixing and storage areas. Kit is packed in a highly visible yellow, chemical resistant carry bag. Pickup rating is 5 gallons of liquid per kit. 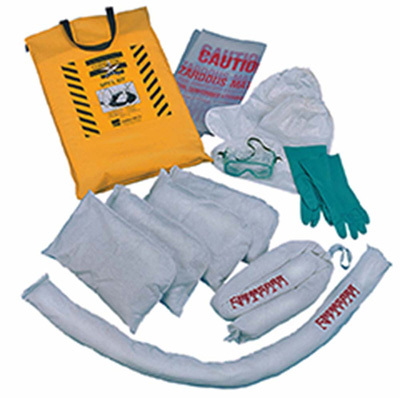 Each kit includes: 2 Chemsorb" Universal Sorbent diking tubes (3"x48"), 4 Chemsorb" Universal Sorbent pillows (16"x9"x2"), 2 HazMat disposal bags, 1 pair 15 mil Nitril gloves, 1 pair safety goggles, 1 pair chemical resistant boot covers, and instructions for use. 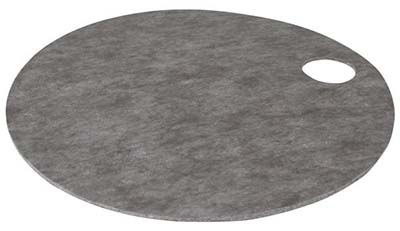 22" Diameter Universal Drum Toppers help keep your shop clean and neat. Rapidly soaks up all liquids, both oil-based and water-based. 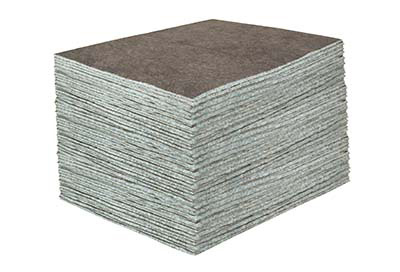 Low linting, dimpled, incinerates to less than two percent ash. Designed for cleaning up and removing oil and petroleum-based solvents, paints, vegetable oils and other non-water soluble chemicals on land or water. 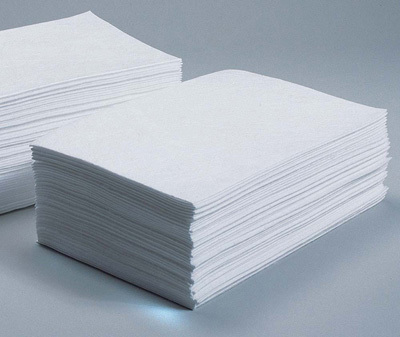 Pads will not absorb water - and they are wringable, dustless, unaffected by temperature, flame resistant and will not rot or mildew. Incineration residue of less than 0.2% ash. Total absorption is about 36 gallons of oil-based liquid. 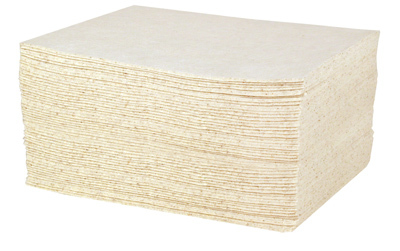 Box of 100 perforated 16"x20" pads. 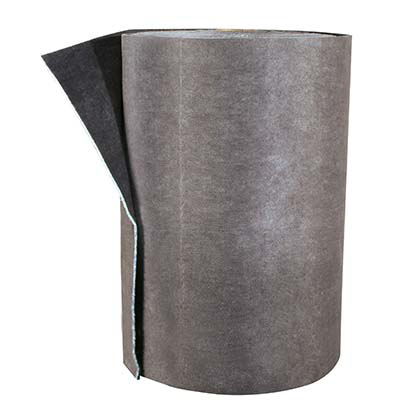 Universal Sorbent Roll, 15" X 150' - in dispenser box. 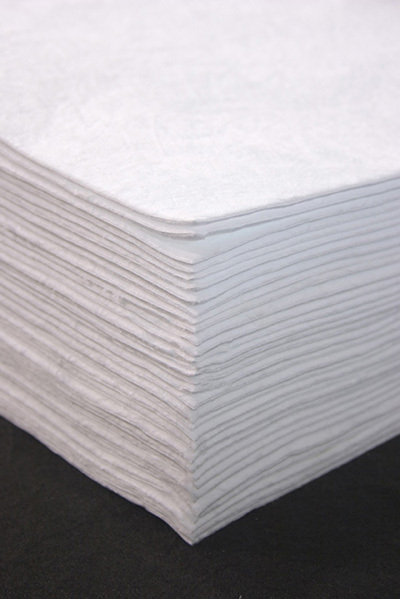 Medium weight, general purpose sorbent pads and rolls are great for all universal applications - will absorb all liquids. 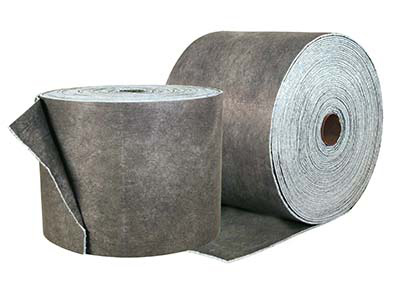 Low linting formulation, and incinerates to less than two percent ash. 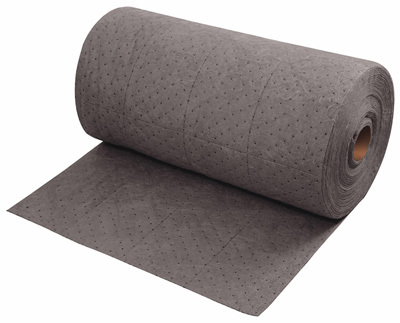 Oil only Sorbent Roll, 15" X 150', in dispenser box. 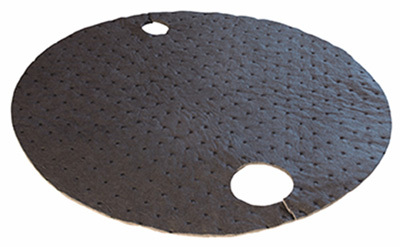 Great for oil spills, our meltdown sorbent pads are made from a single layer of strong, uniform polypropylene fibers. Hydrocarbon based fluids stick to the fibers while water is repelled. 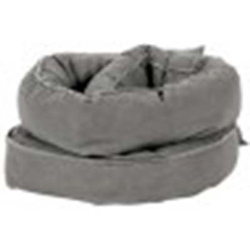 Incinerates to less than two percent ash, will not mildew and will float immediately. Use for fast cleanup and removal of water-, oil- or solvent-based chemicals including pesticides, acids, alkalis and other hazardous liquids. 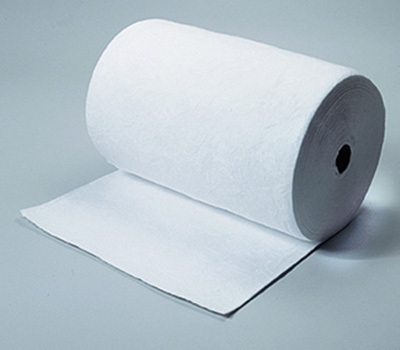 Heavyweight, dimpled pad is low lint, strong and chemically inert. Total absorption is about 30 gallons per box. Box of 100 16"x20" pads.